The function has a minimum value of zero at the point [1,1]. 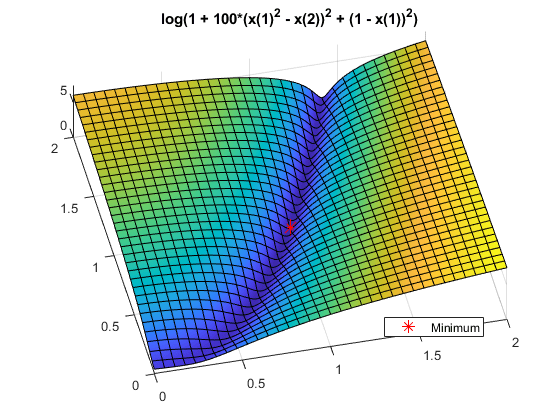 Because the Rosenbrock function is quite steep, plot the logarithm of one plus the function. The simple_fitness function file implements Rosenbrock's function. A fitness function must take one input x where x is a row vector with as many elements as number of variables in the problem. The fitness function computes the value of the function and returns that scalar value in its one return argument y. To minimize the fitness function using ga, pass a function handle to the fitness function as well as the number of variables in the problem. To have ga examine the relevant region, include bounds -3 <= x(i) <= 3. Pass the bounds as the fifth and sixth arguments after numberOfVariables. For ga syntax details, see ga.
ga is a random algorithm. For reproducibility, set the random number stream. The x returned by the solver is the best point in the final population computed by ga. The fval is the value of the function simple_fitness evaluated at the point x. ga did not find an especially good solution. For ways to improve the solution, see "Common Tuning Options" in Genetic Algorithm. a and b are parameters to the fitness function that act as constants during the optimization (they are not varied as part of the minimization). The parameterized_fitness.m file implements this parameterized fitness function. Use an anonymous function to capture the values of the additional arguments, namely, the constants a and b. Create a function handle FitnessFunction to an anonymous function that takes one input x, and calls parameterized_fitness with x, a, and b. The anonymous function contains the values of a and b that exist when the function handle is created. See Passing Extra Parameters (Optimization Toolbox). To gain speed, vectorize your fitness function. A vectorized fitness function computes the fitness of a collection of points at once, which generally saves time over evaluating these points individually. To write a vectorized fitness function, have your function accept a matrix, where each matrix row represents one point, and have the fitness function return a column vector of fitness function values. Change each variable x(i) to x(:,i), meaning the column vector of variables corresponding to x(i). Change each vector multiplication * to . * and each exponentiation ^ to .^ indicating that the operations are element-wise. There are no vector multiplications in this code, so simply change the exponents. %   Copyright 2004-2010 The MathWorks, Inc. This vectorized version of the fitness function takes a matrix x with an arbitrary number of points, meaning and arbitrary number of rows, and returns a column vector y with the same number of rows as x. Tell the solver that the fitness function is vectorized in the 'UseVectorized' option. Include options as the last argument to ga.
What is the difference in speed? Time the optimization both with and without vectorization. Using vectorization took 0.154365 seconds. No vectorization took 0.220625 seconds. In this case, the improvement by vectorization was not great, because computing the fitness function takes very little time. However, for more time-consuming fitness functions, vectorization can be helpful. See Vectorize the Fitness Function.